Back in the Hovel the morning started with a bang. Or at least a crash. Tootsie, still wearing the cone of shame, knocked over the gate Thirteen had been using to sequester her in one place. Chena was standing on the sofa bed. When the gate hit the floor with a gigantic bang, Chena leaped through the air, like a deer, and landed across the room behind me where I was sitting on my bed. This is the morning I learned that dogs can fly. We packed up everything and got the dogs situated in the truck. Traveler Thirteen hooked the camper back up to the truck and back down the crazy hill we went. I got out to make sure we cleared the corner again where we tried not to hit the corner of a house or go sliding down a washout. And then we were back on the road. In Espanola, I took over driving for a bit. 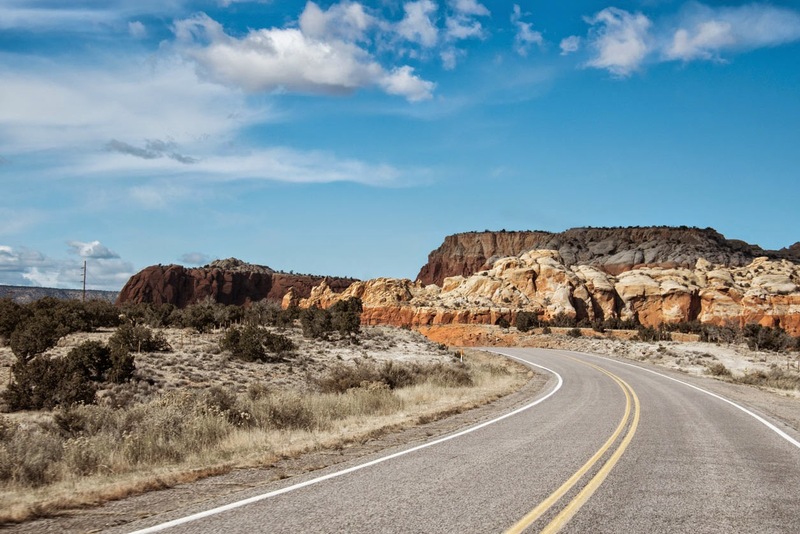 We went northwest on 84 toward Abiquiu. This route skirts the Rio Chama. 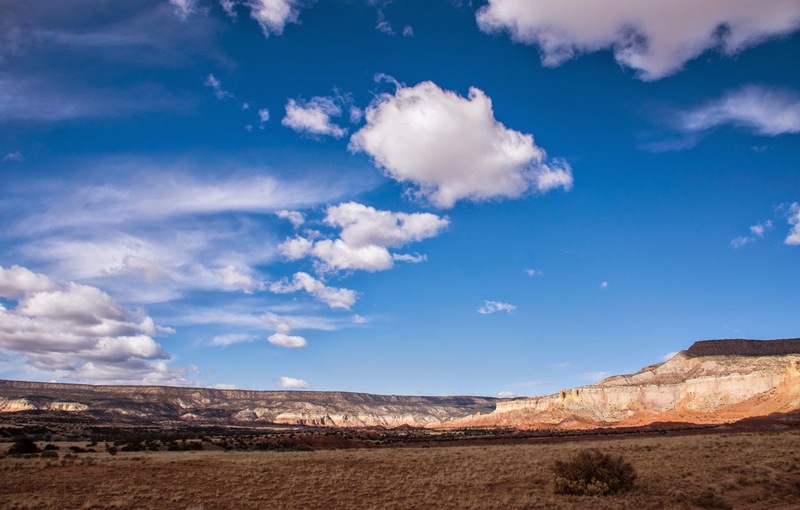 The Rio Chama Valley has been inhabited for more than 5,000 years. 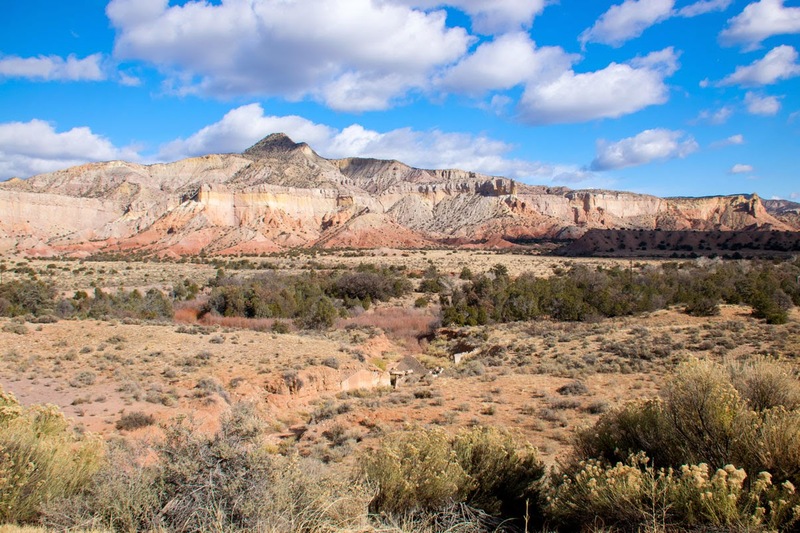 Pueblo, Navajo, Apache, Ute, Spanish, and Anglo-Europeans have all called this valley home. Lake Abiquiu. Pedernal Mountain in the far left. Abiquiu is also Georgia O'Keefe country. 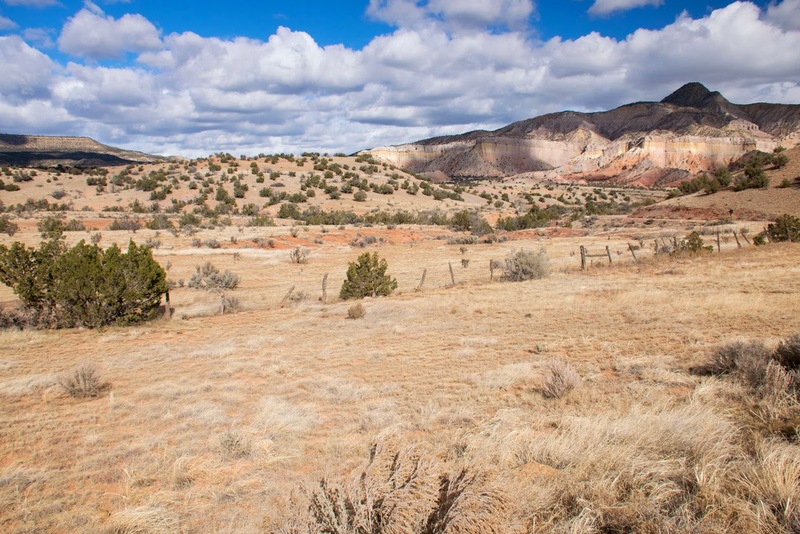 She lived at Ghost Ranch for many years. 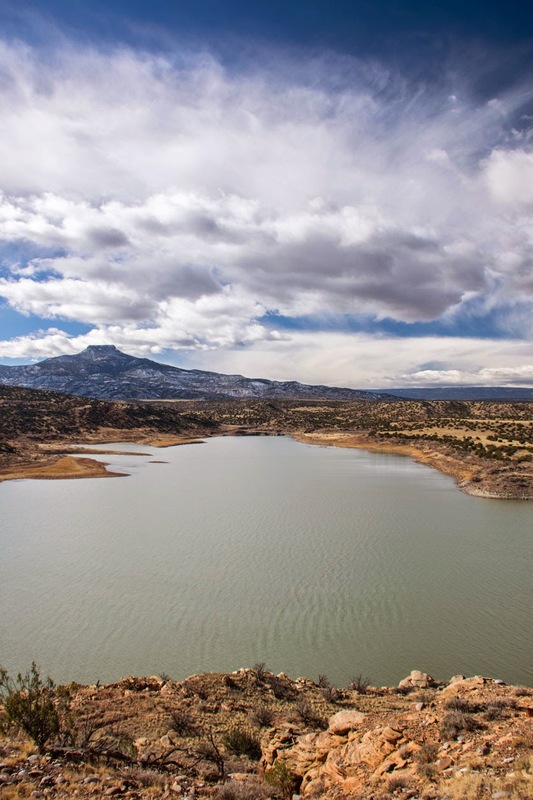 It is located on 84 past the Abiquiu Lake. It is beautiful country. 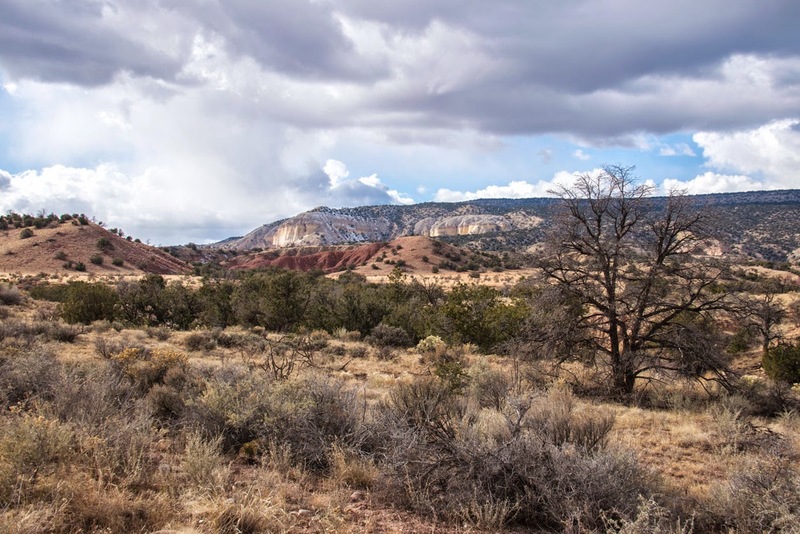 Abiquiu is also known as a former dwelling place of witches. There are many legends about witches that still roam this area. Since the Spanish arrival in the mid-18th century, Abiquiu has been the center of tales of misfortunes caused by the evil deeds of brujas (witches). Traveler Thirteen, Tootsie, and Chena in the mirror. Abiquiu Lake Visitor Center parking lot. Our first stop was Abiquiu Lake. 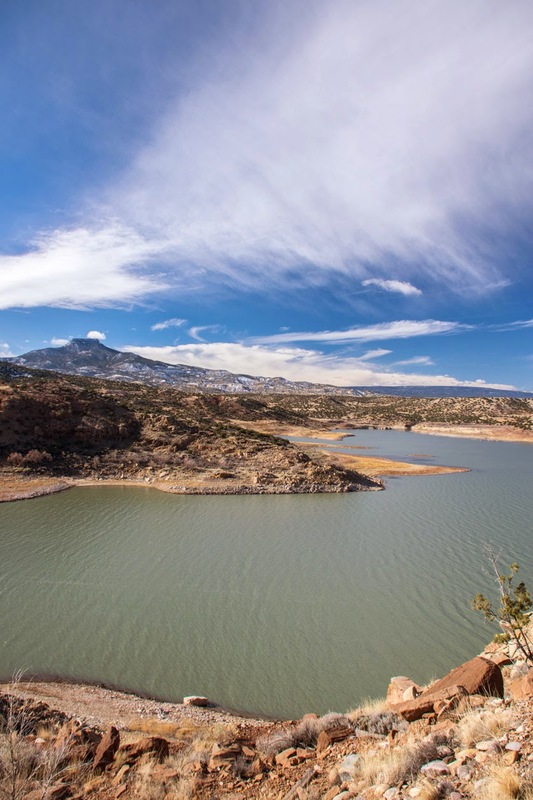 This lake was created by the Army Corps of Engineers and serves as water supply for Albuquerque. 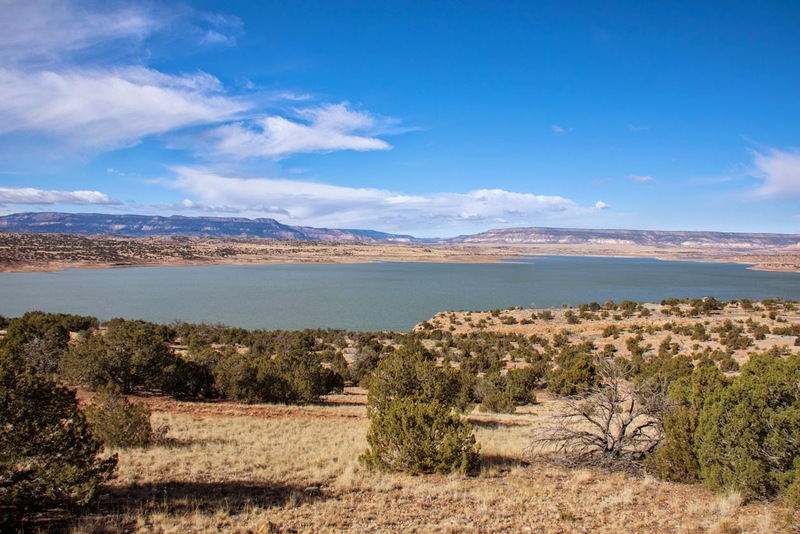 The lake sites between the Sangre de Cristo and San Juan Mountain Ranges. 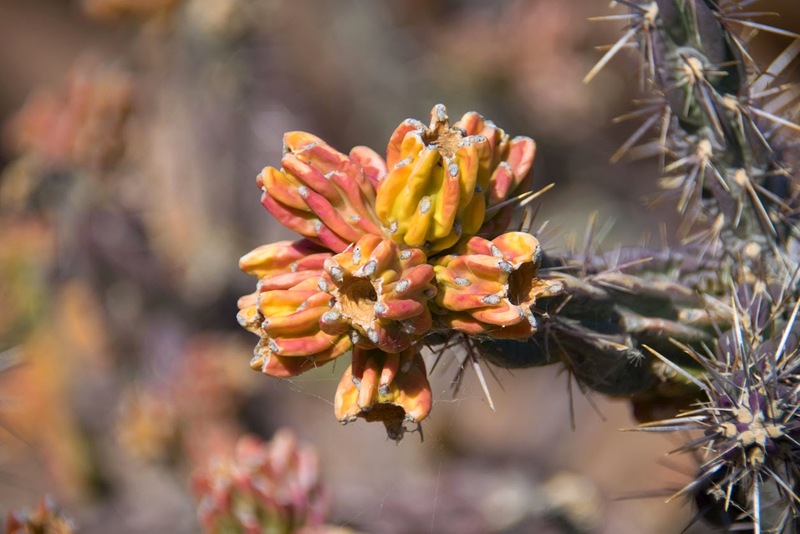 It sits at a elevation of 6,400 feet above sea level, which places it in the Pinon Pine/juniper life zone. 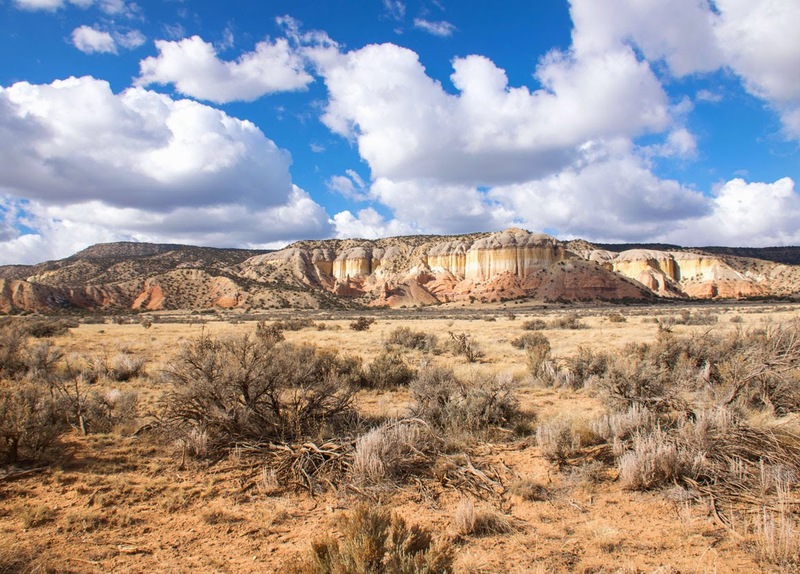 This valley area has long been known as Piedra Lumbre, or Fire Rock. The name comes from Pedernal Mountain, the flat topped mountain that stands sentinel over the lake. The mountain is primarily composed of flint, a rock traditionally used to start fire. 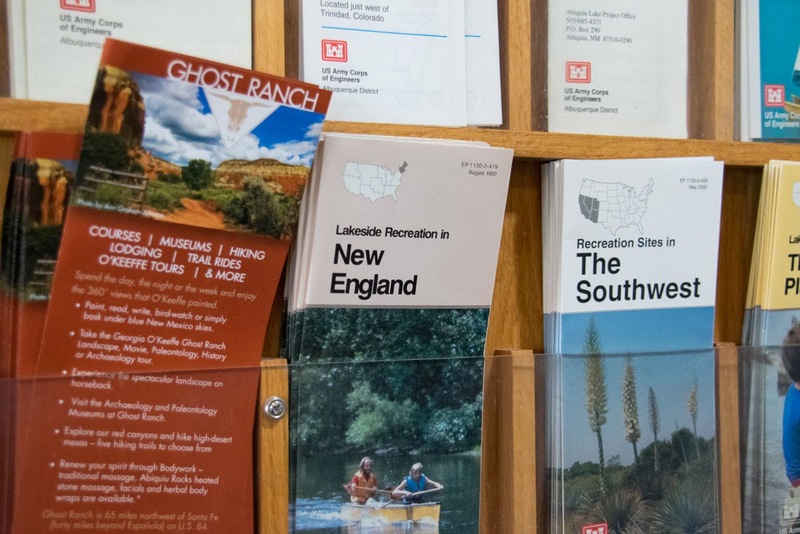 Well...we came all the way to New Mexico to find a guide to New England (where I'm from) and a guide to The Southwest, which just happens NOT to include New Mexico. 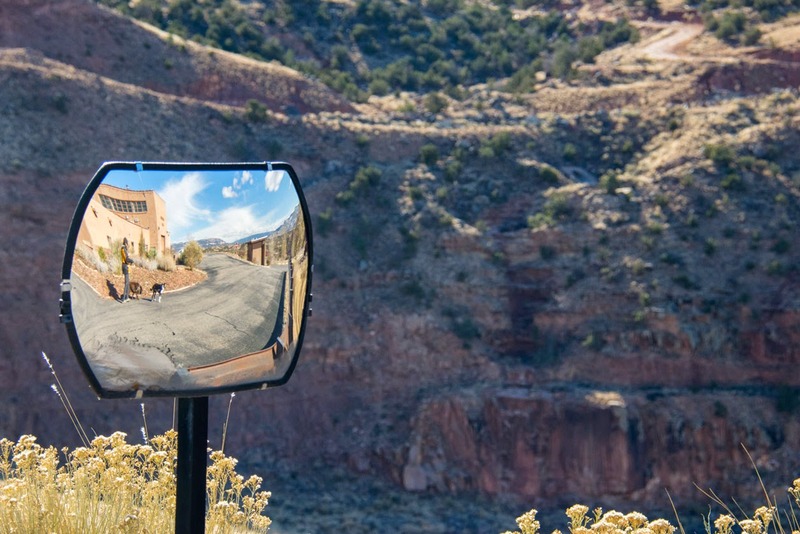 We parked at the Abiquiu Lake Visitor Center. Today Tootsie, who was feeling good, joined us for a hike. We took the Pinon Trail, which skirts the heights above the lake and then down around the Riana Campground on the lake shore. It was windy but sunny. American Coots bobbed in a flotilla out on the lake. The clouds did dramatic things passing along the mountains. Bluebirds and juncos flitted through the pines. Cottontail Rabbits outran Chena much to her consternation. Lake Abiquiu. The clouds starting to get interesting. Lake Abiquiu. The clouds having a change of mood. 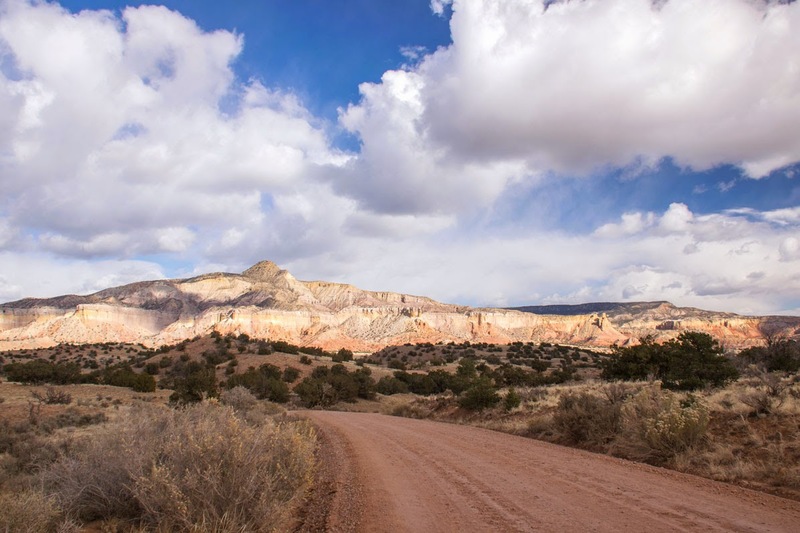 Driving down Route 84 toward Ghost Ranch. 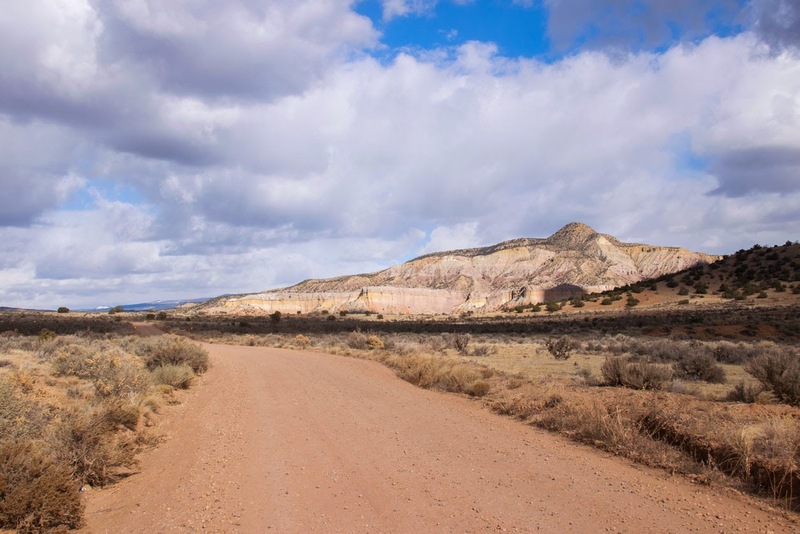 We then stopped briefly at Ghost Ranch but then decided, since we had the dogs, to travel down Route 151, which leads to the Monastery of Christ in the Desert and skirts the Rio Chama. We wandered down 151 and were treated to a light show by the clouds as they shifted through the sky, revealing the deep reds, yellows, bright whites, greens, and purples of the hills around us that were actively worshipped by cacti covered in thorns. At the intersection of Routes 84 and 151. We made peanut butter and jelly sandwiches and ate them as we headed out to Route 96 toward Cuba. As we turned onto 96 the sky darkened behind us and these immense clouds, some dark, some light trailed all the way to the ground, and sailed along the plains and mountains like ethereal threatening towers. We took the north route into Chaco Canyon. 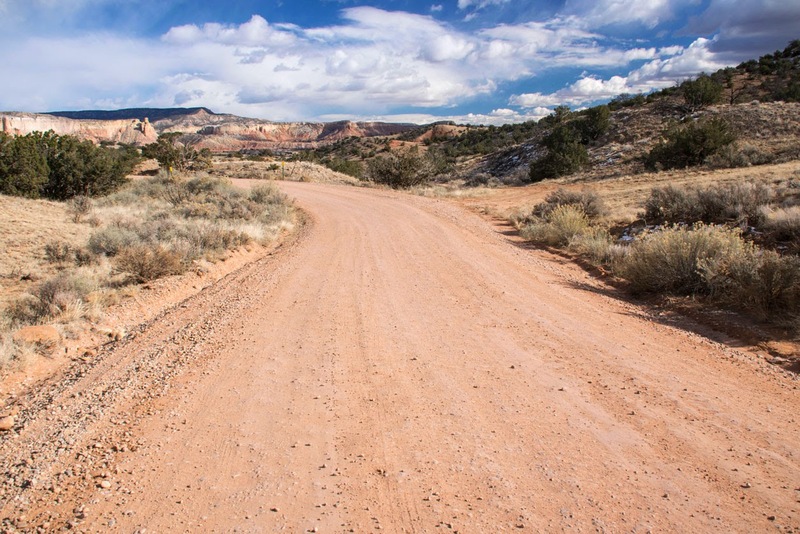 You take Route 550 out to 7900 and then turn onto the unpaved 7950. This isn't an easy drive, especially pulling a camper. There are cattle grates and the road is a washboard for miles. It's not an easy drive so be warned. But you drive through beautiful grasslands, much of it reservation land. 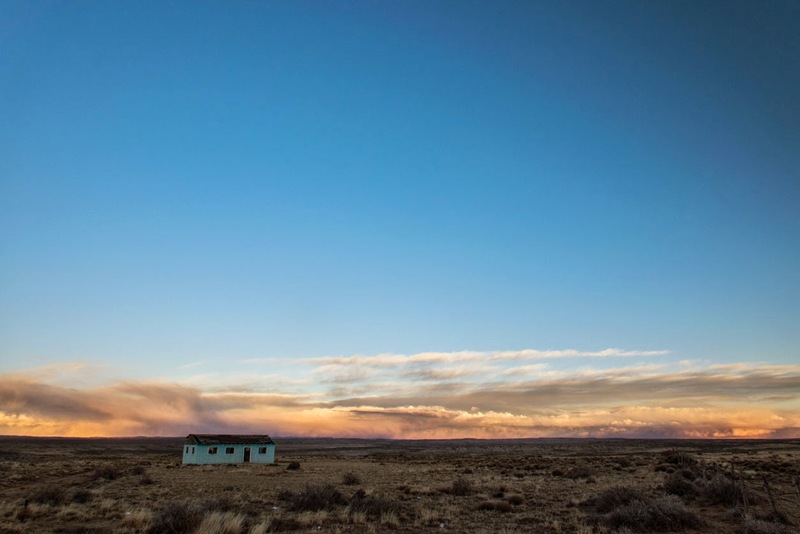 As we approached Chaco Canyon, Fajada Butte was outlined in purple in a glowing gold sky. It was a magic sky. I don't think I'll ever see a sky again that looks like that. 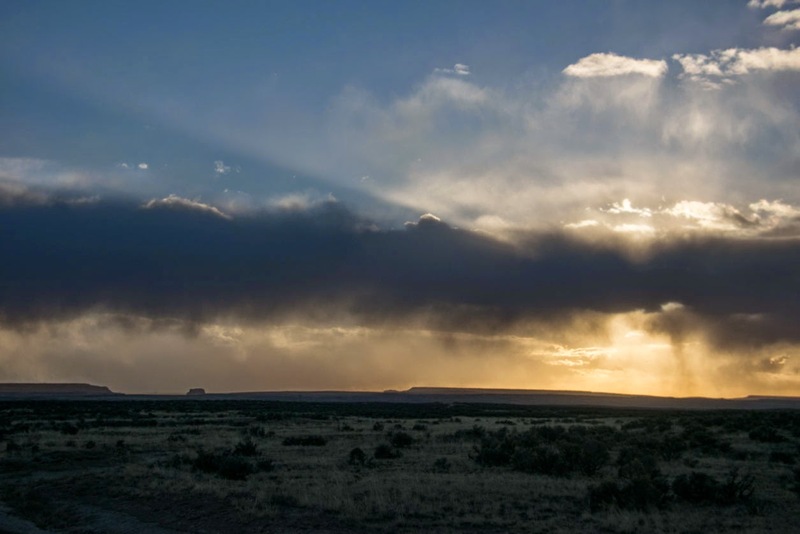 The magical sky over the entrance to Chaco Canyon. Fajada Butte on the left. 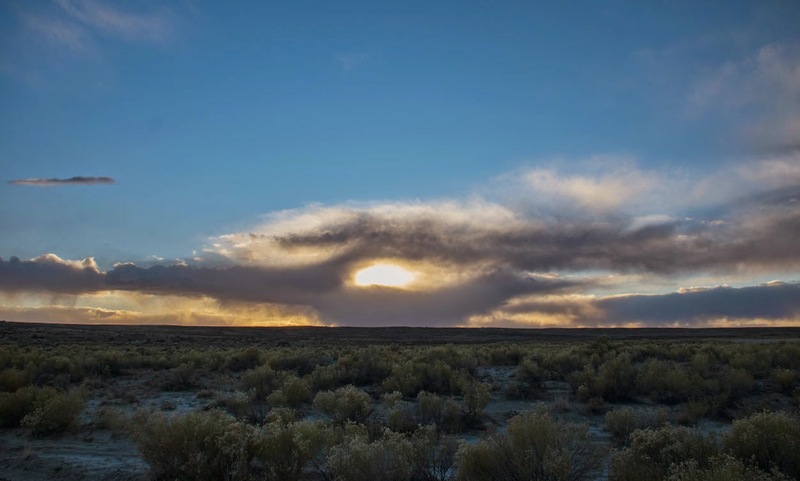 At Chaco Canyon National Historical Park you will find the densest concentration of pueblos in the American Southwest. 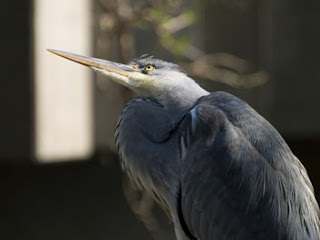 It preserves one of the most important pre-Columbian cultural and historical areas in North America. We were planning on camping at Chaco Canyon for two nights. It was going to get down to a balmy 11 degrees Fahrenheit that night. As soon as we began to get ourselves settled Traveler Thirteen discovered a major problem with the electricity in the camper and thus no heat. It soon became obvious that we were not going to be camping that night. It was already dark even though it was only 5 pm. The stars were coming out in their thousands. But we had to leave. Traveler Thirteen very bravely drove us back out through the horrible washboard road in the dark, dodging rabbits, not always successfully. The coyotes would eat well that night. Once back on 550 we drove toward Bloomfield/Farmington, where the nearest RV repair place was located. I don't know what it is about Traveler Thirteen and I. We have some sort of karma where we have to find ourselves driving for miles in the dark on difficult roads while hungry as hell and trying to find some place to stay. This happened to us in Ecuador too. But we managed to find a room at Motel 6. Pizza was delivered. Alcohol was consumed.